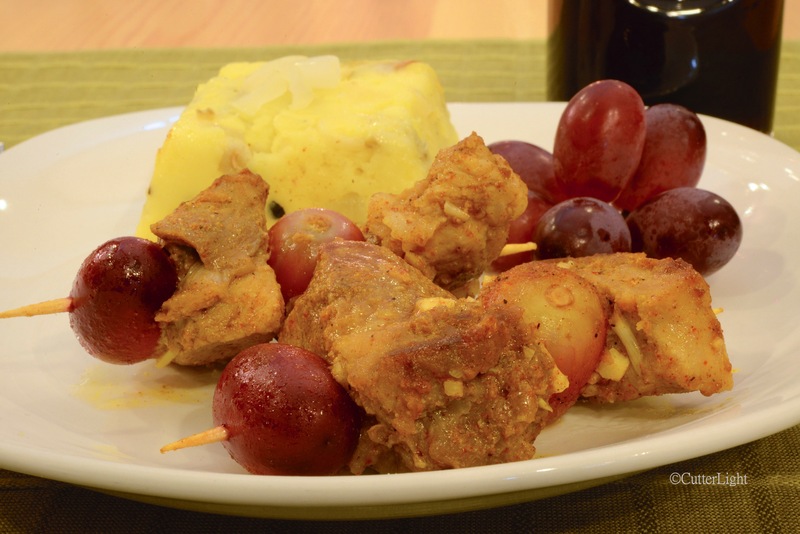 One of Spain’s most popular tapas, pinchos morunos features skewered pork and flame grapes in a dish that balances citric tang and sweetness against a mix of fiery and savory spices. Our first lesson with The Joy of Mediterranean Cooking was a tasty success! Pinchos refers to small wooden skewers and morunos means “in the way of the Moors.” Of course, when the Moors, who were from Morocco, crossed the Mediterranean Sea in 711 CE (Common Era) the dishes they brought with them would have reflected their Islamic faith, which means that pork would have been off the menu. When Spain finally won independence, they employed all the wonderful spices the Northern Africans had introduced to create a grilled dish with pork. It’s been a favorite tapa there ever since. Flame grapes go perfectly with the marinated grilled pork. Here in Ulaanbaatar, Mongolia, we found tiny 4-inch (10 cm) skewers that were perfect for serving these as a snack, an appetizer or a main entrée. We’ve mentioned The Great Courses in previous posts and would be remiss if we didn’t mention this excellent company here. Thus far, we’ve studied baking, cooking, photography and wine appreciation through them, all from the comfort of our own home (or boat), all at very reasonable prices and all with topnotch instructors. It’s been a long held dream to study cooking at the Culinary Institute of America, an institution Craig Claiborne likened to the Juliard of professional cooking. Here we are, in Mongolia, studying Mediterranean Cuisine with CIA’s Chef Bill Briwa and loving it! Cooking: Deep Fried Parsnips – World’s Best Bar Snack? Baking: Chocolate Mousse Cake – Chocolate, Chocolate, Chocolate! For the marinade, combine spices in a mixing bowl. Add orange juice, lemon juice, garlic and olive oil. Stir together. Add cubed pork to briefly marinate – approximately 20 minutes. Skewer flame grapes and pork, alternating pork, grape, pork, grape. Cook in a dry skillet or on a grill over medium high heat for about 5 minutes, turning once to ensure even cooking. The pork should be nicely browned. Garnish with chopped parsley and lemon wedges. We served our pinchos morunos with smashed baked potatoes whipped together with onions and garlic sautéed in butter and white wine and a light cheese. Enjoy pinchos morunos with a Riesling, Sangria or a cold beer. ← Brownie Blondies, Blond Brownies, Brownie Double Deckers… Hey, Brownies! Thanks for the reblog! Happy eating! Any excuse to eat pork. I’m SO there! The pig is a magical animal! I like the recipe because the ingredients are available here . And it doesn’t need an oven. 🙂 I think I can cook it one day. Thanks for sharing!